iPhone | MusicEdTech: Teach music. The technology will follow. I did it. I got the new iPhone. I arrived at the store at 8 AM and I was about the 60th person in line. Between the long line and computers slow or crashing, I waited six hours. I have never done something like that before, waited the first day something came out, and there’s a really good chance I never will again. I will say, however, it was worth it. It’s an amazing device and I am very excited to have and learn about a hand held computer. Trust me, I didn’t get the iPhone for the phone! When Apple announced they were opening up software development for the new iPhone to outside sources, it meant you no longer need to hack or “jailbreak” your phone to get some of the cool applications that were already available. Sure enough, those applications are already on the iTunes site. 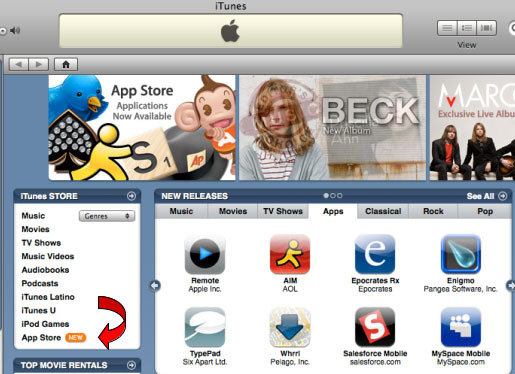 Simply go to the iTunes Store and find the link for the App Store.